As conventional understanding suggests, neutron stars are created when massive stars collapse at the end of their life cycles. Gravity in those stars is said to be is so intense that they cannot resist the collapse, so electrons are squeezed into the nuclei that make up their structures. As astrophysicists state, those collapsed stars can become less than 100 kilometers in diameter, but can weigh 10^12 kilograms per milliliter. As they contract, angular momentum increases, resulting in rapid rotation. 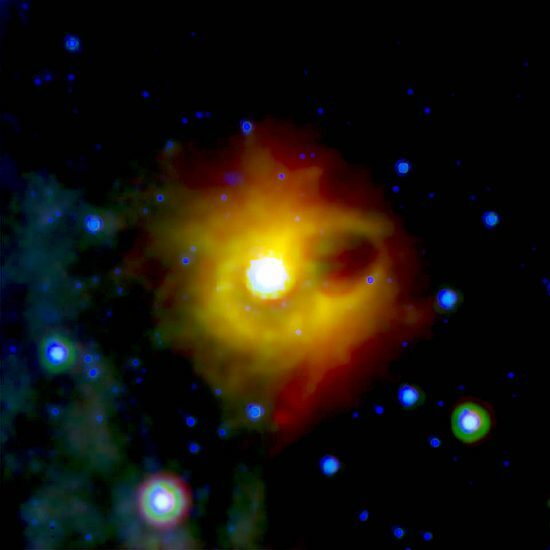 If a particular star is large enough, it can become a “magnetar”. Magnetars are usually identified as “X-ray pulsars” or “soft gamma repeaters”. As conventional theories argue, they can reach magnetic field strengths measuring over 10^15 Gauss. Earth’s magnetic field is about one-half Gauss, so these “magnetic pulsars” are surprisingly powerful. Pulsars (and, by extension, magnetars) are most likely concentrations of electricity focused by some kind of “dense plasma focus” effect. The dense plasma focus provides the mechanism by which cosmic electric currents can influence the evolution and morphology of space structures.